Hopefully, by now you know what Sriracha is. You may even have a friend so obsessed with it that they have a Sriracha shirt or carry a mini bottle of Sriracha on their keychain. This hot sauce has such a cult following that it has even been incorporated into a beer. That’s right, Rogue Ales, has a stout beer that they have infused with Sriracha. It may sound crazy, but it’s really good. I knew I wanted to make a crazy Cajun turkey this year for Thanksgiving. I planned to inject it with a beer/seasoning mixture. When I was at the store and saw Rogue’s Sriracha beer, I knew it was meant to be. If you’re intimidated at the thought of injecting a turkey, don’t be. It’s insanely easy, and you can buy a meat injector for about $7. Your bird will come out super juicy and burst with flavor. You and your family will be overjoyed you did it. 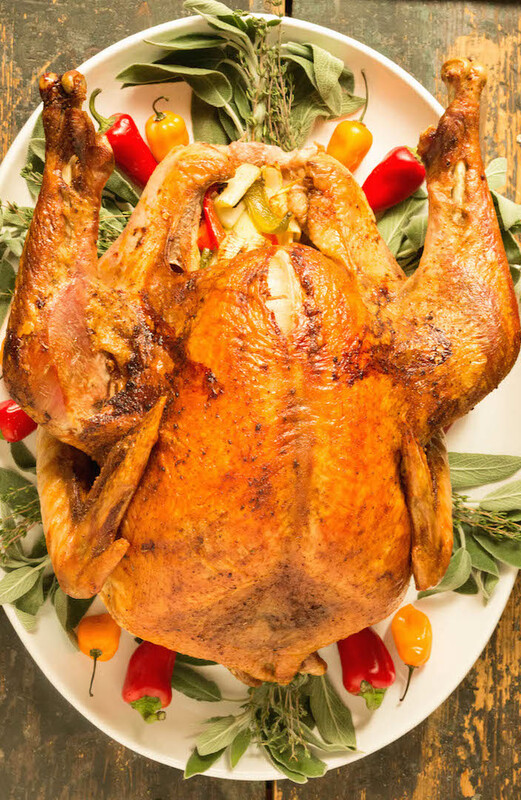 While this Cajun Turkey has some spice to it, I would not consider it “spicy.” So don’t be afraid to serve it if you have guests who don’t normally eat spicy foods. If you want it to be extra hot, double or triple the amount of cayenne pepper and put an extra tablespoon of Sriracha in the injection marinade. If you can’t find Sriracha beer, I would use another stout and double the amount of Sriracha. If you want to make a Turkey that is sweet rather than hot, I would recommend my Sweet Tea Brined Turkey recipe. 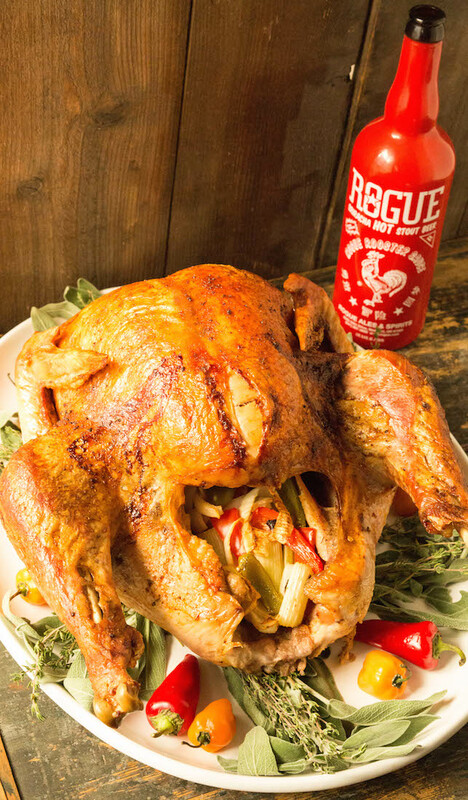 I hope your family enjoys this Sriracha Beer Injected Cajun Turkey as much as we do. Right now my head is spinning just thinking of all the stuff I should do with the leftovers. Last year I made a Thanksgiving pizza, but I think I want to take it in a different direction this year. Maybe a crazy sandwich or pastry? Does your family have any favorite Thanksgiving leftover recipes? If so, please let me know in the comments so I can try it out. I’m going to have a lot of leftovers. To make the cajun spice rub, mix all ingredients together in a small bowl. One hour before roasting, remove turkey from the refrigerator. Fill up your meat injector with the Sriracha beer marinade. Inject the turkey all over. I usually inject each breast, each leg, each wing, each thigh, and both sides of the back of the turkey. Sprinkle with the cajun spice rub. Massage into the skin. Brush all over with oil. Fill cavity with the bell peppers, celery, and onion. Place additional veggies around the turkey in the roasting pan. Cook 2-3 hours, basting occasionally. Turkey is done when the thickest part of the breast is 165°. Remove from oven and let rest for 20 minutes until carving. A stout beer infused with Sriracha doesn’t sound any weirder than mixing beer with Clamato. It’s probably very tasty. That turkey looks amazing. It’s picture perfect, and with the injected marinade, I bet it’s super moist. I really think I need to find a meat injector and give this one a try. My hubby loves Sriracha. Interesting take on a Thanksgiving classic! I must be honest I’ve always wanted to make chicken injected with marinade but never really got done with it… This looks so good. I cannot wait to try it. I love Sriracha.. YUM! I love anything Rogue makes, but I had no idea they make a sriracha ale. I can’t decide what I want to do first: drink one or make this turkey! I loved the video! I forgot you could inject turkey before baking. I need to try this. Does it come out moist? Was wondering if you can’t find that rogue sriracha beer what could you use in it’s place? I would use a dark beer in its place and add an extra tablespoon of Sriracha to the injection marinade. Hope you enjoy! Is there a different kind of beer you can use? I don’t have sriracha hot stout near me. Preferably a name of beer? Just use any stout or dark beer and add 1 tablespoon of Sriracha.